Canadian National Railway Company (NYSE:CNI) was in 24 hedge funds’ portfolios at the end of the fourth quarter of 2018. CNI has experienced a decrease in support from the world’s most elite money managers in recent months. There were 26 hedge funds in our database with CNI holdings at the end of the previous quarter. Our calculations also showed that CNI isn’t among the 30 most popular stocks among hedge funds. According to most stock holders, hedge funds are seen as unimportant, outdated investment tools of years past. While there are more than 8000 funds with their doors open at present, Our researchers look at the top tier of this club, around 750 funds. These money managers orchestrate bulk of the smart money’s total capital, and by keeping track of their first-class picks, Insider Monkey has brought to light many investment strategies that have historically surpassed the market. Insider Monkey’s flagship hedge fund strategy beat the S&P 500 index by nearly 5 percentage points per year since its inception in May 2014 through early November 2018. We were able to generate large returns even by identifying short candidates. Our portfolio of short stocks lost 27.5% since February 2017 (through March 12th) even though the market was up nearly 25% during the same period. We just shared a list of 6 short targets in our latest quarterly update and they are already down an average of 6% in less than a month. We’re going to check out the new hedge fund action surrounding Canadian National Railway Company (NYSE:CNI). At Q4’s end, a total of 24 of the hedge funds tracked by Insider Monkey were bullish on this stock, a change of -8% from the previous quarter. 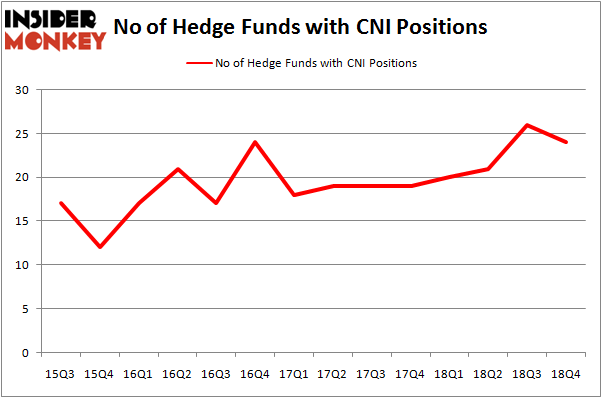 On the other hand, there were a total of 20 hedge funds with a bullish position in CNI a year ago. With hedgies’ sentiment swirling, there exists a few key hedge fund managers who were adding to their holdings significantly (or already accumulated large positions). More specifically, Bill & Melinda Gates Foundation Trust was the largest shareholder of Canadian National Railway Company (NYSE:CNI), with a stake worth $1269.3 million reported as of the end of September. Trailing Bill & Melinda Gates Foundation Trust was Arrowstreet Capital, which amassed a stake valued at $265.4 million. Renaissance Technologies, Citadel Investment Group, and AQR Capital Management were also very fond of the stock, giving the stock large weights in their portfolios. Since Canadian National Railway Company (NYSE:CNI) has witnessed bearish sentiment from the entirety of the hedge funds we track, we can see that there were a few funds that decided to sell off their entire stakes in the third quarter. Interestingly, Steve Cohen’s Point72 Asset Management sold off the biggest stake of the 700 funds monitored by Insider Monkey, totaling about $29.9 million in stock, and Clint Carlson’s Carlson Capital was right behind this move, as the fund dropped about $13.5 million worth. These transactions are interesting, as total hedge fund interest fell by 2 funds in the third quarter. 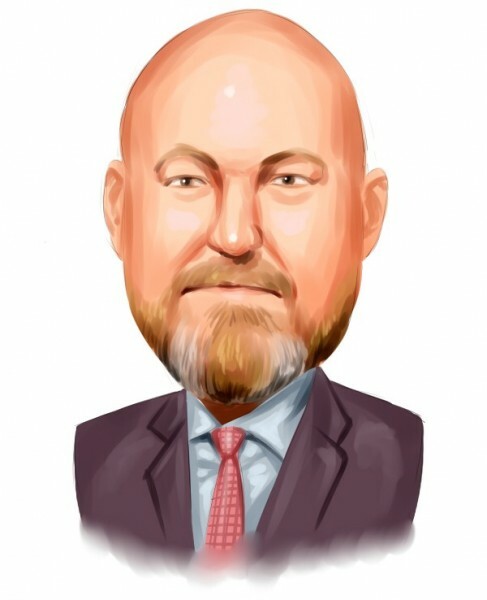 Let’s now take a look at hedge fund activity in other stocks – not necessarily in the same industry as Canadian National Railway Company (NYSE:CNI) but similarly valued. We will take a look at T-Mobile US, Inc. (NASDAQ:TMUS), The PNC Financial Services Group Inc. (NYSE:PNC), Enterprise Products Partners L.P. (NYSE:EPD), and Shire PLC (NASDAQ:SHPG). This group of stocks’ market values are similar to CNI’s market value. As you can see these stocks had an average of 50.25 hedge funds with bullish positions and the average amount invested in these stocks was $2878 million. That figure was $1908 million in CNI’s case. T-Mobile US, Inc. (NASDAQ:TMUS) is the most popular stock in this table. On the other hand Enterprise Products Partners L.P. (NYSE:EPD) is the least popular one with only 25 bullish hedge fund positions. Compared to these stocks Canadian National Railway Company (NYSE:CNI) is even less popular than EPD. Our calculations showed that top 15 most popular stocks among hedge funds returned 19.7% through March 15th and outperformed the S&P 500 ETF (SPY) by 6.6 percentage points. Hedge funds were also right about betting on CNI, though not to the same extent, as the stock returned 18.9% and outperformed the market as well. Hedge Funds Have Never Been This Bullish On Thermo Fisher Scientific Inc. (... Do Hedge Funds Love Diageo plc (DEO)? Were Hedge Funds Right About Dumping Twenty-First Century Fox Inc (FOX)? Were Hedge Funds Right About Buying Costco Wholesale Corporation (COST)? Itau Unibanco Holding SA (ITUB): Are Hedge Funds Right About This Stock? Were Hedge Funds Right About Buying United Technologies Corporation (UTX)?